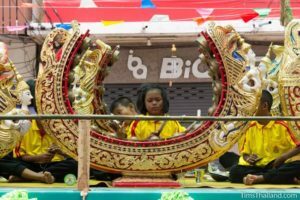 These photos are from the Boon Khao Phansa (บุญเข้าพรรษา) celebration in Khorat city on July 27 and 28, 2018. 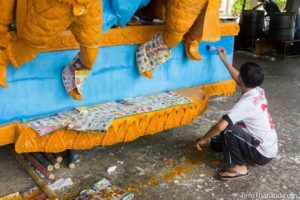 Most of the parade float-making photos were taken on July 19. 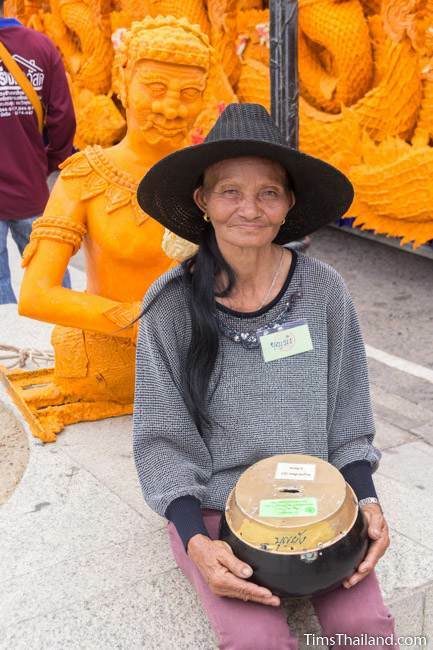 Thanks to Ajahn Mai at Wat Nong Bua Rong for answering so many questions. 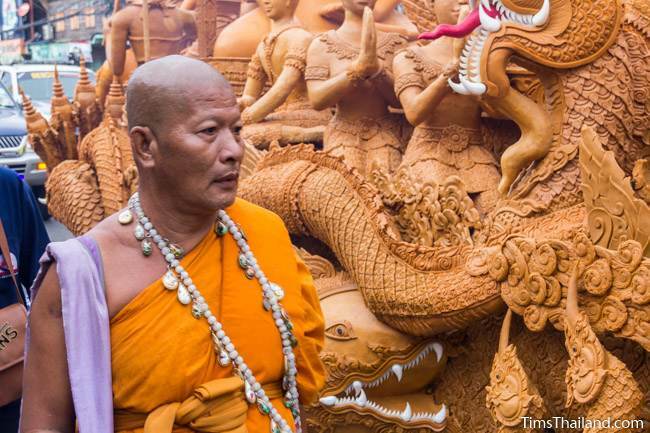 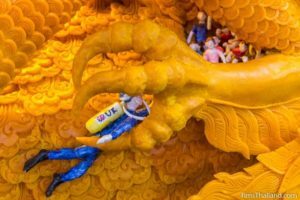 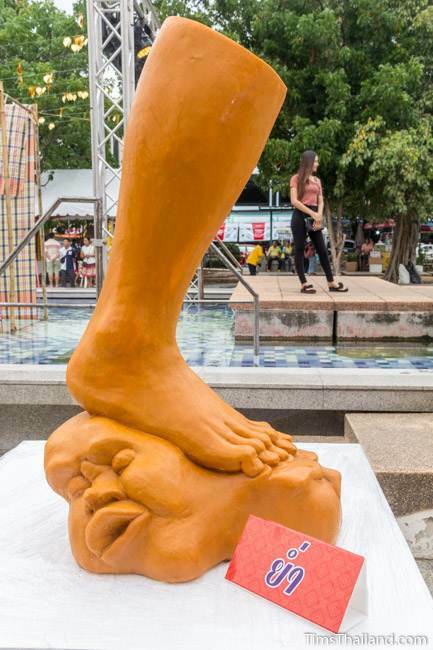 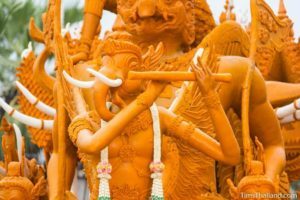 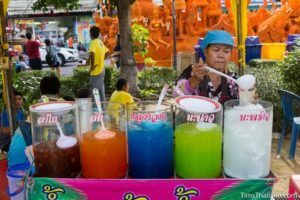 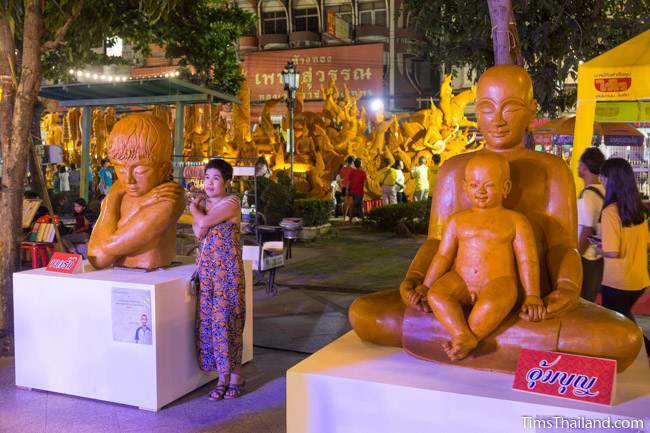 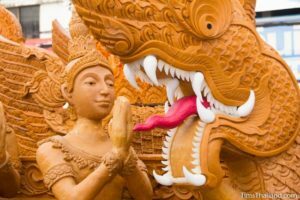 For more information, there's an explanation of Boon Khao Phansa and an overview of heet sip-song, the twelve Isan merit-making traditions. 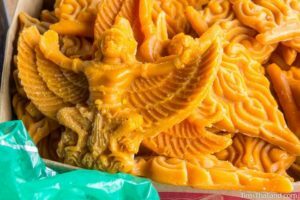 Boon Khao Phansa, the first day of the Buddhist Rains Retreat (usually called Buddhist Lent in English) is closely associated with candles because during this time serious monks spend extra time studying dharma and/or meditating, and before electricity they needed extra candles. 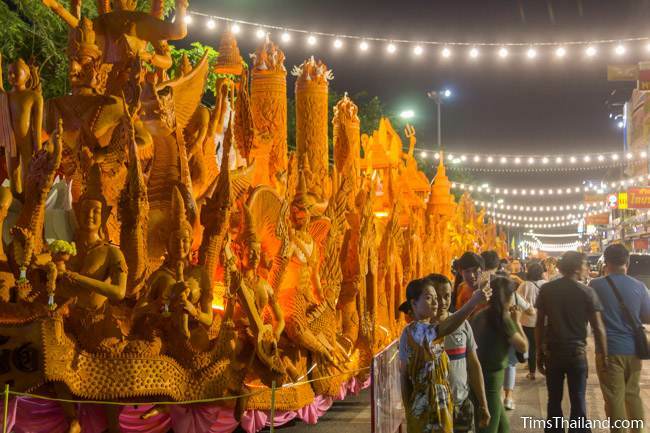 Since the candles are now purely symbolic, many people like to donate large decorative ones. 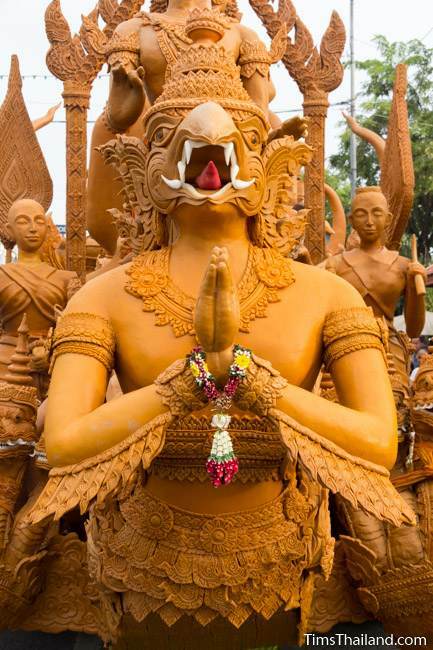 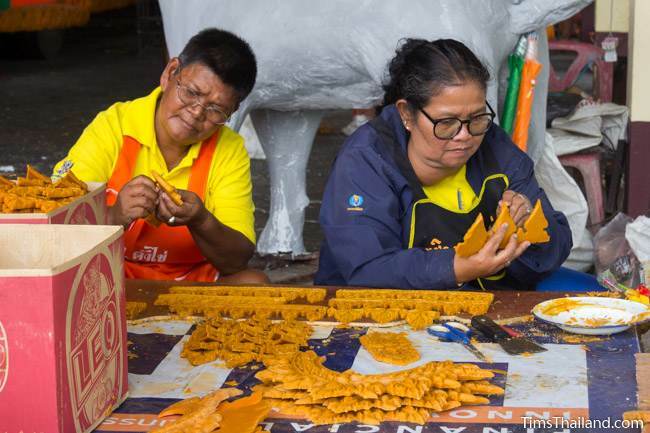 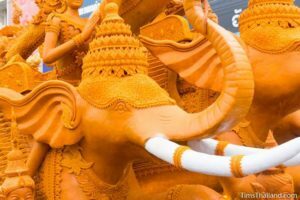 As is clear to see, making this style of giant candle parade float (kabuan tian phansa) takes months of work (usually three or four) and lots of volunteers. 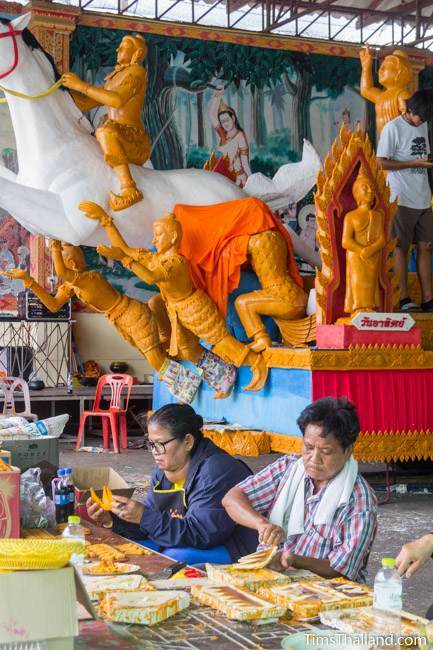 Hundreds of people help out, some coming by for a few hours here and there, while others are at the temple more or less daily from start to finish. 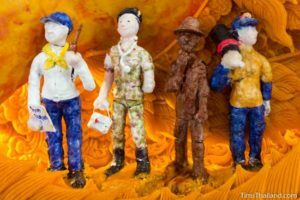 The candle floats are not solid blocks of wax, each piece is built on a frame of foam, wood, or wire mesh covered in paper mache. 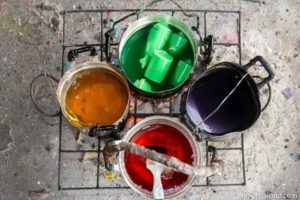 Clay is sometimes stuck onto these frames for small details such as buttons or folds in fabric. 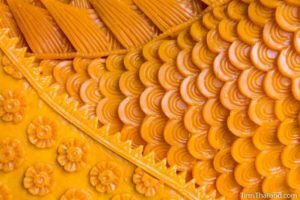 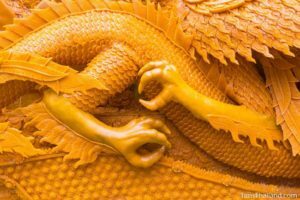 Feathers, jewelry, scales, and the intricate trim are made in silicon molds. 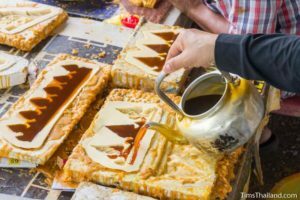 Each piece, after being poured, takes at least ten minutes to dry before the mold is peeled off and the excess wax cut away. 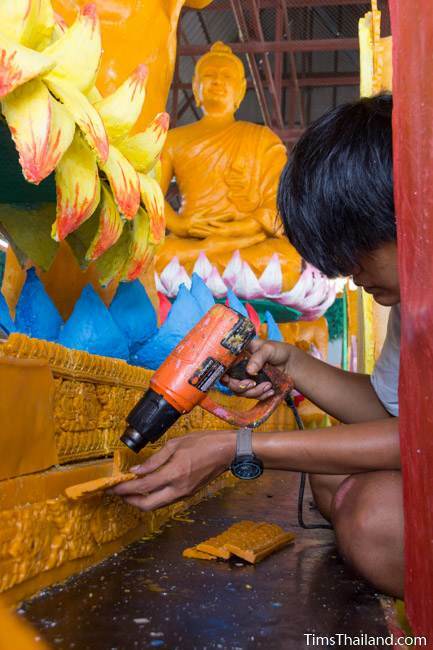 These pieces are usually attached by melting their backs and the connecting surface with a heat gun, though some builders use nails and screws. 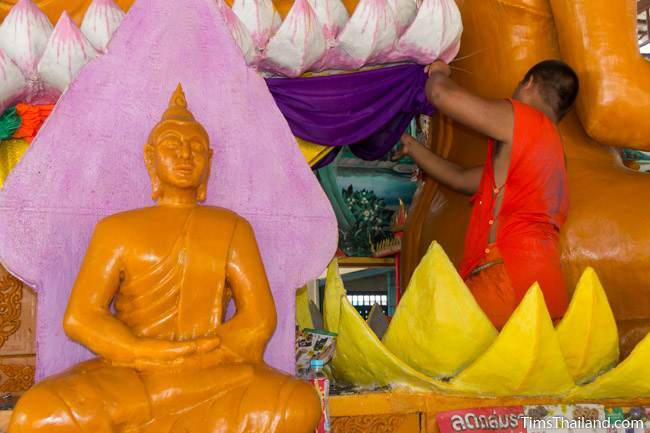 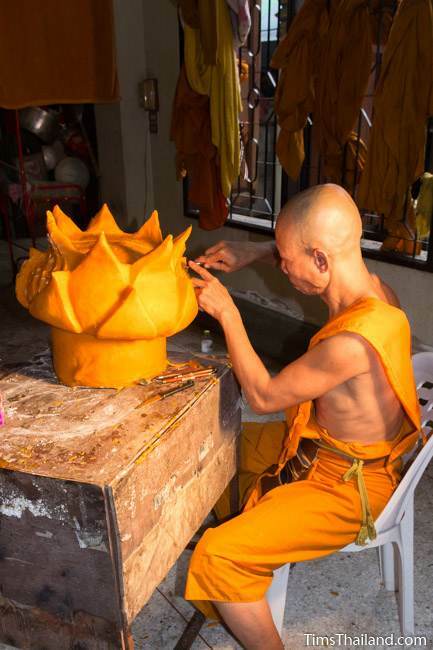 Colors other than the standard Buddhist orange are painted on with multiple layers of melted wax. 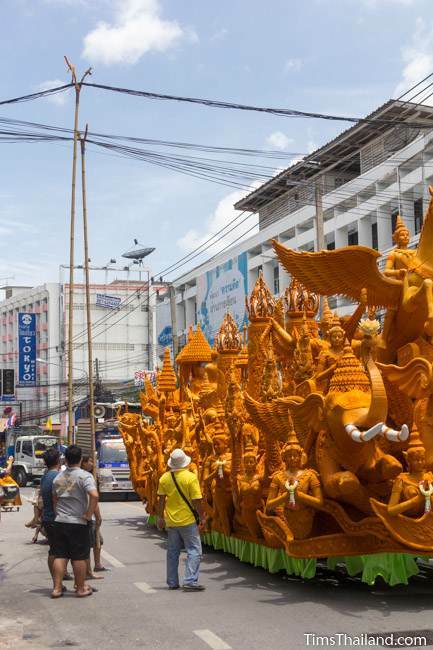 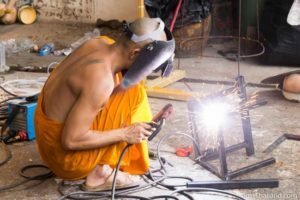 Wat Pho and Wat Nong Bua Rong are two temples in downtown Khorat that make candle floats and people are welcome to come by to watch the construction at any time. 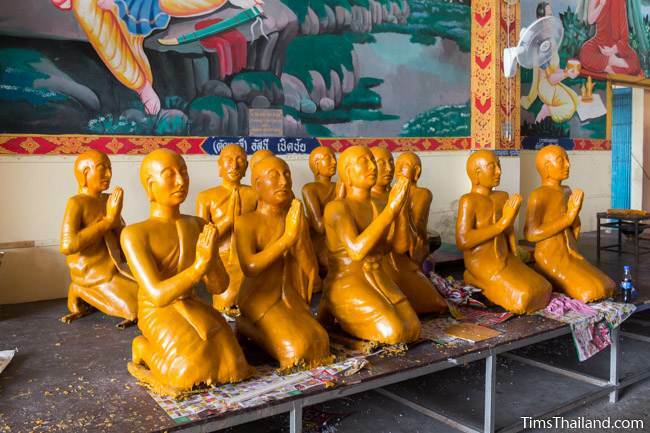 This is the same at every temple in every town where they are made. 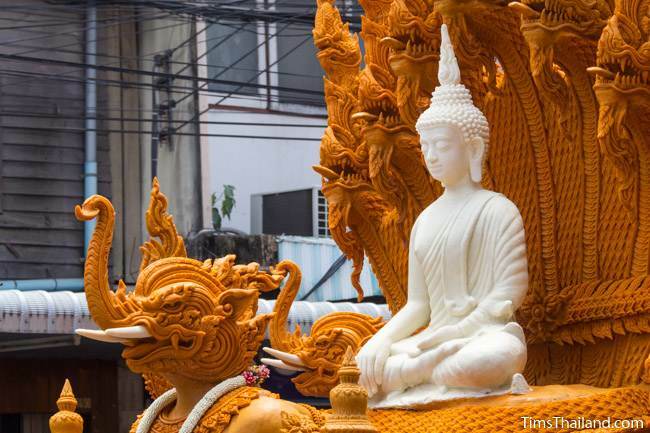 Post-parade, most candle floats are parked under roofs at their temples until it's time to melt down the wax and begin again, so even if you aren't around for the parade, you can still enjoy the candle floats. 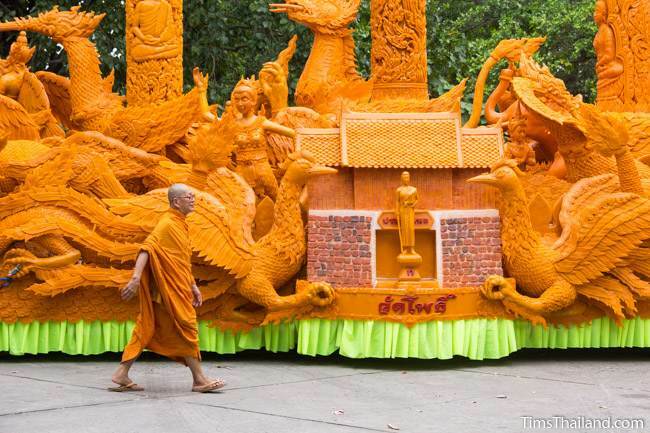 The candle parade floats are not only impressive for their size, they're genuine works of art. 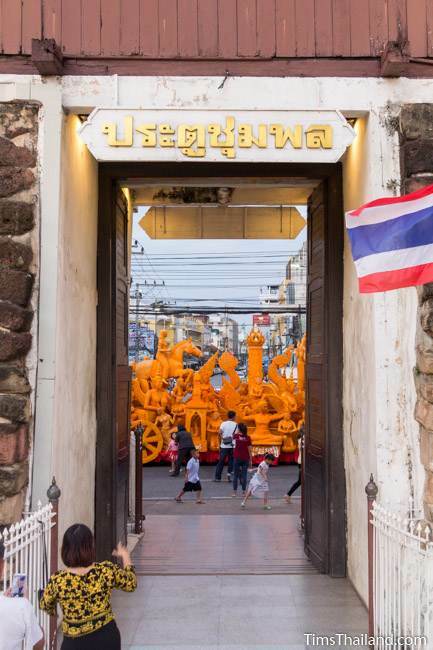 Subject matter is largely limited to Buddhism and many of the various gods from Buddhist cosmology, but groups do sometimes include historical and cultural themes (such as the Thao Suranari Monument and Chumphon Gate, Khorat city's two main landmarks, shown in the first picture below) and current events. 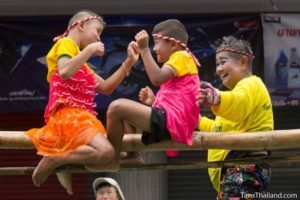 The Tham Luang cave rescue drama, where twelve students and their soccer coach had been trapped in and heroically saved from a flooded cave in Chiang Rai province, played out less than a month before Khao Phansa. 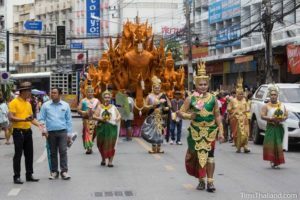 Since the story had gripped the nation, of course many of the parade participants honored the victims and the rescuers in some small way. 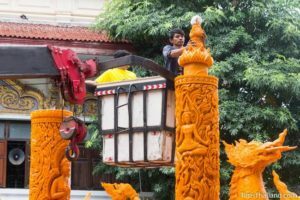 Most of the candle floats were too close to completion to get in on this, but the builders from Wat Pho in Khorat city found a way. 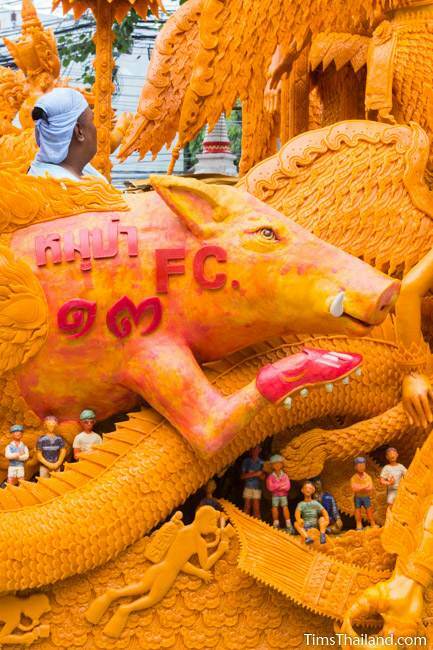 They changed two large fish into wild boars (this was the name of the kids' football team) and added various people from the rescue in the small spaces around them. 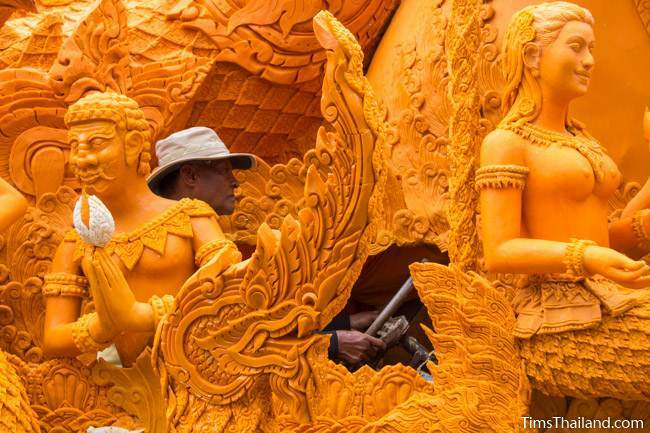 Another temple replaced two deities from the original design with wai-ing scuba divers. 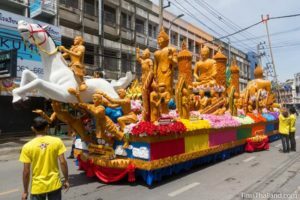 Khorat (and to the best of my knowledge, all other towns that host large candle parades) puts on a small festival the afternoons before and after the parade. 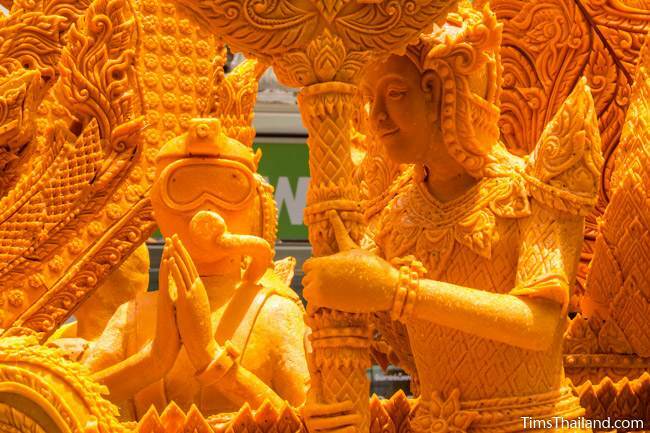 The candle floats are parked here for up-close viewing. 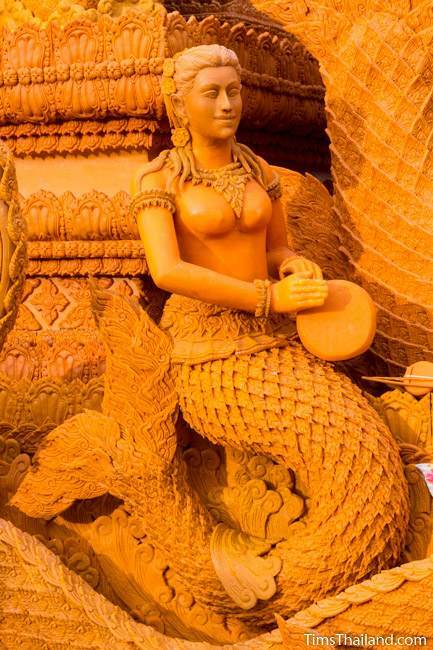 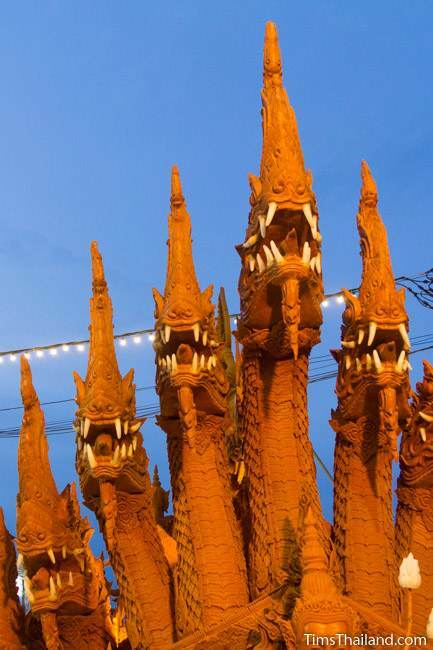 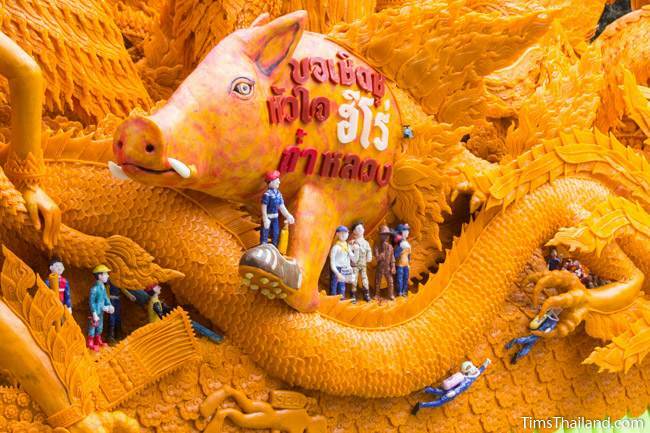 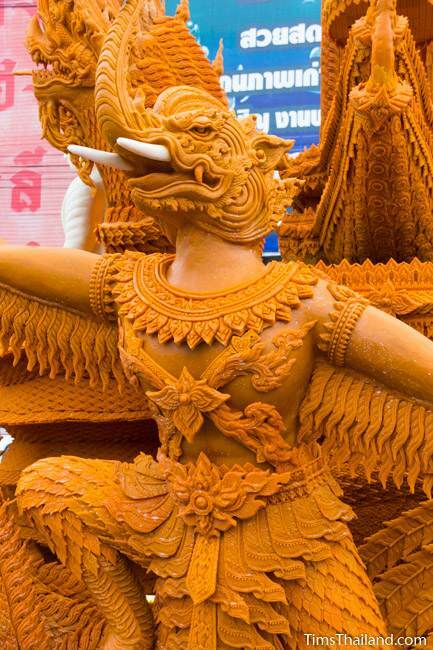 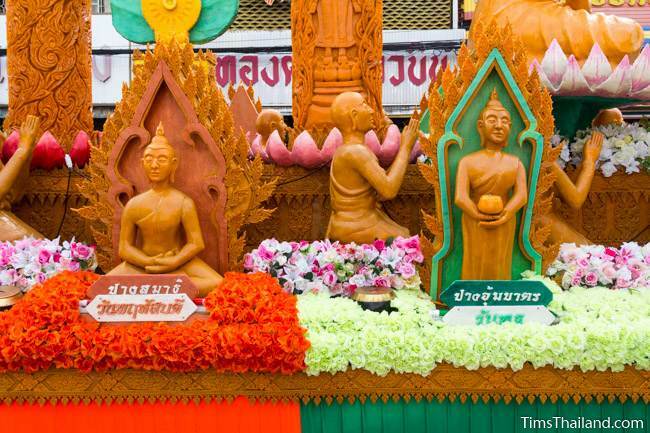 Khorat's festival also has a wax sculpture contest, stage shows, and lots of food. 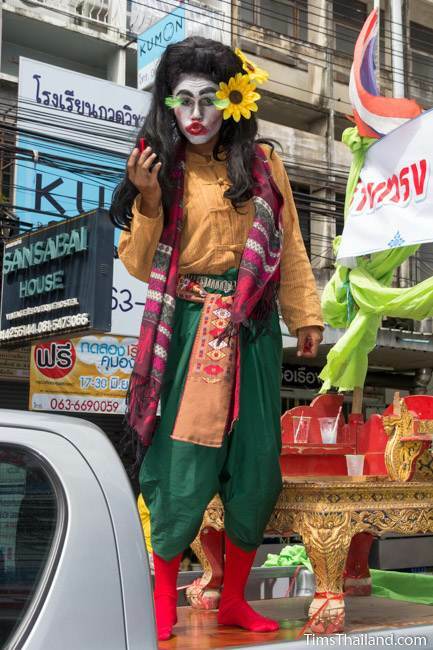 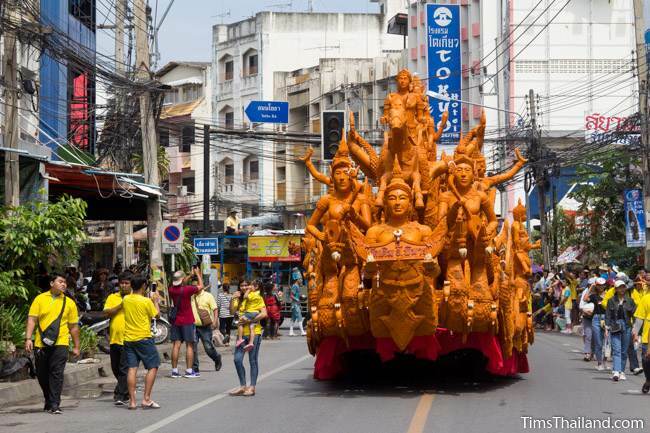 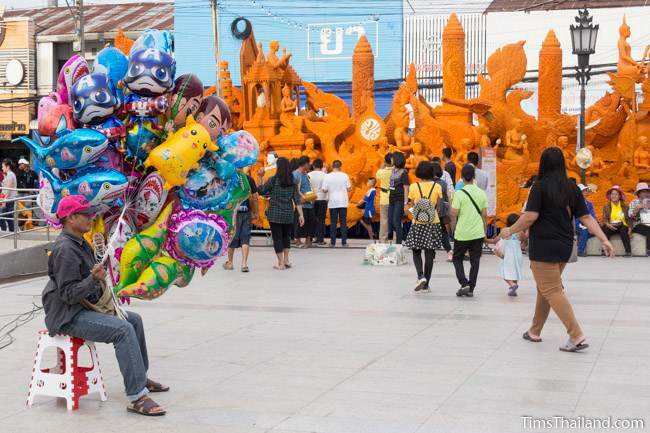 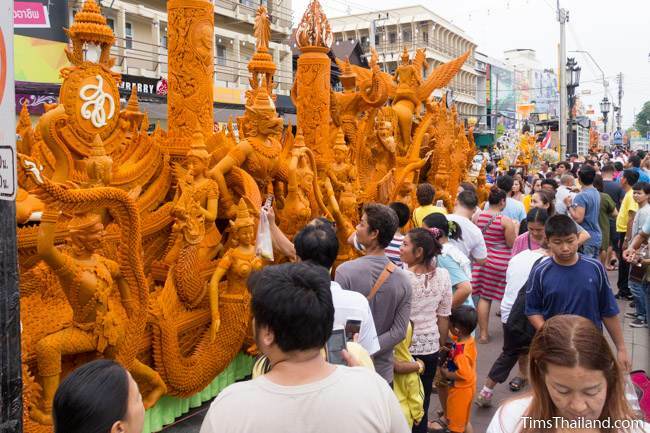 Big candle parades like the one in Khorat (which lasts three hours) are no longer just a part of Khao Phansa. 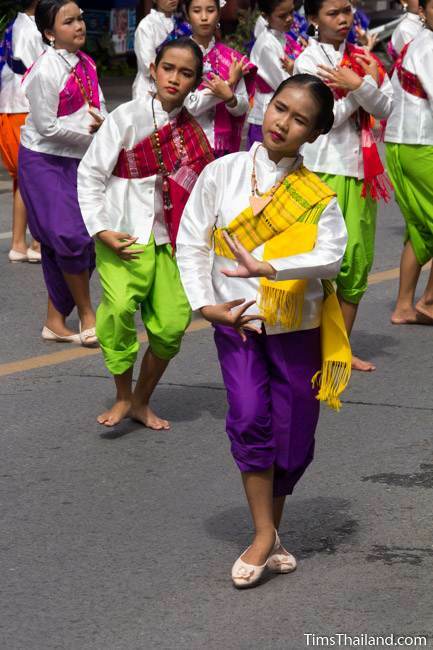 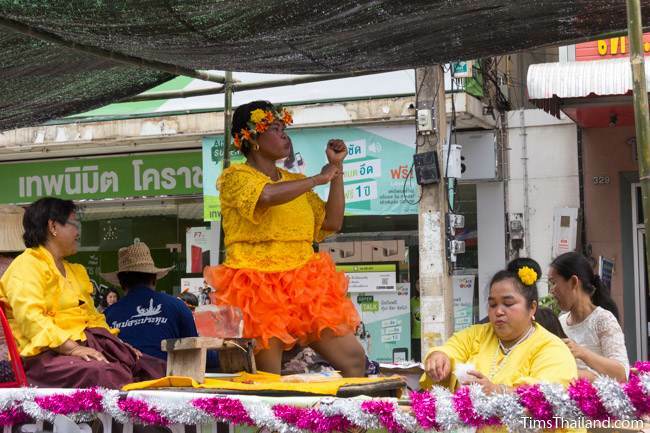 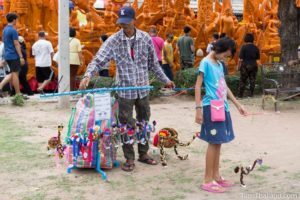 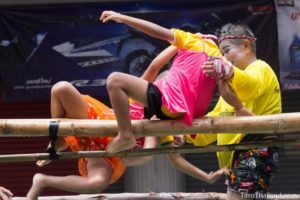 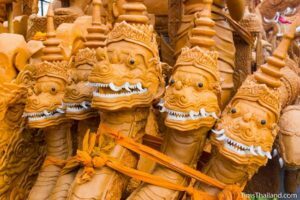 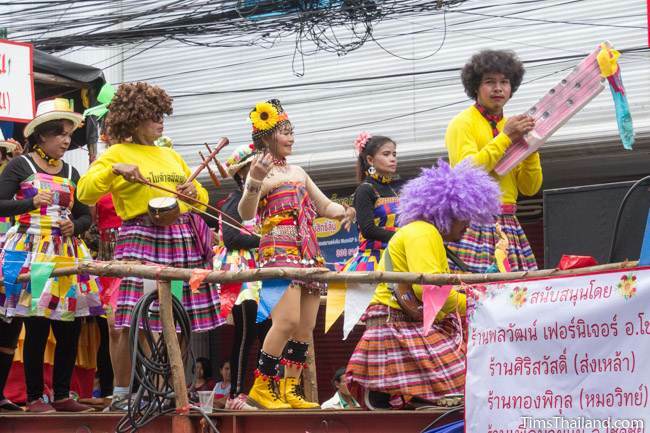 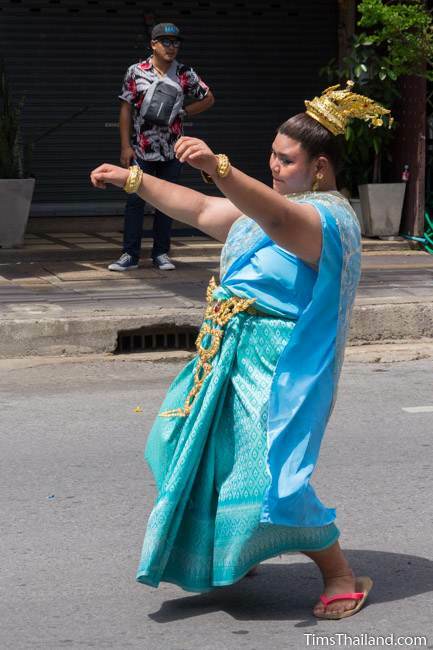 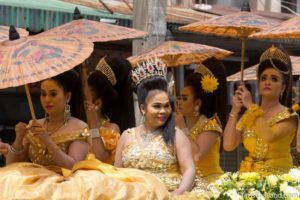 They've become community celebrations and are as long and loud as Isan parades at other times of the year with fun coming foremost. 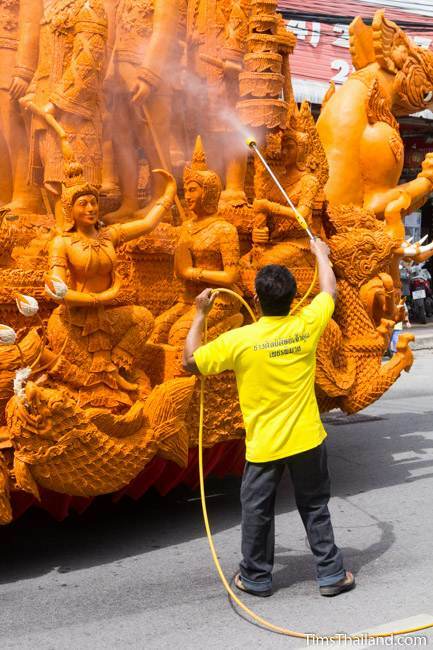 Besides the candle floats, there are all the standard parade pieces: marching bands, dancing, making food in the backs of trucks, anti-alcohol messages, and a lot of men in drag. 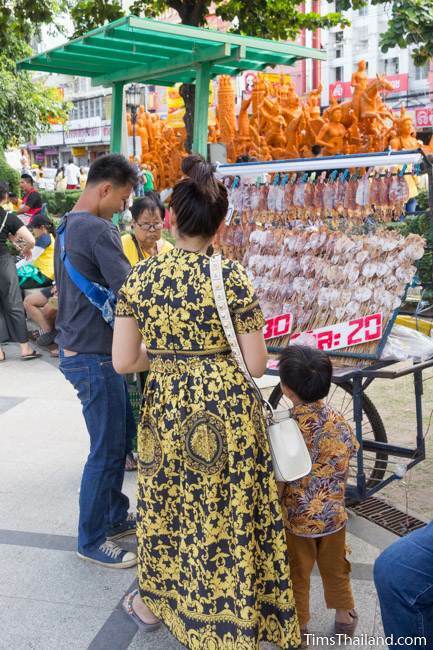 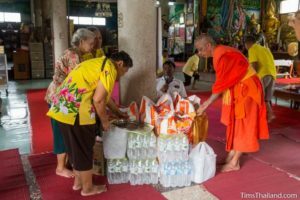 In the afternoon, people will make special donations at the temple. 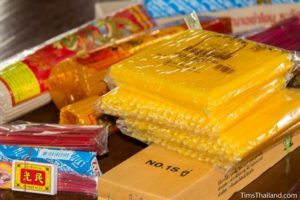 These will include the ordinary items (food, money, toiletries, etc.) 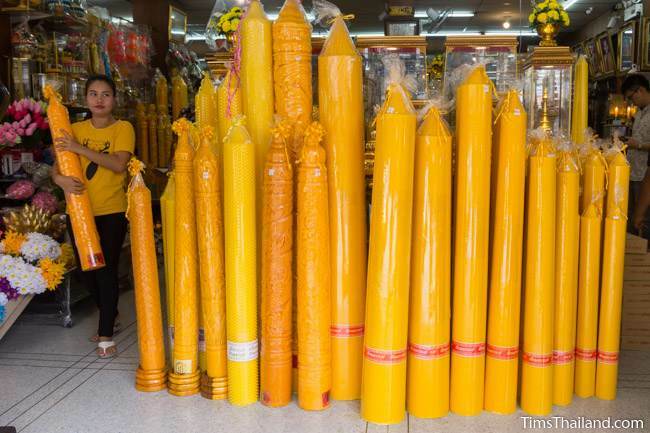 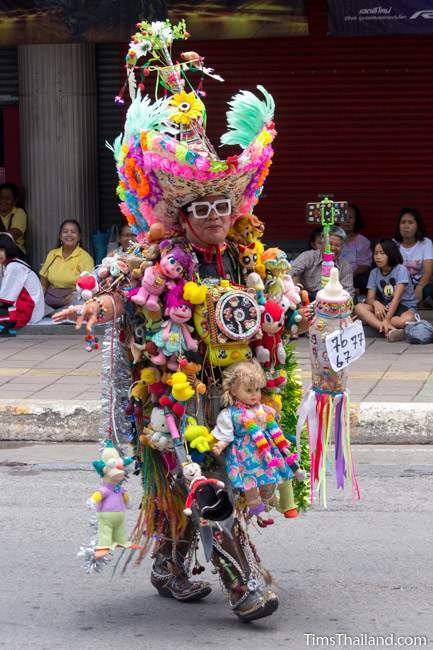 but two items are given specifically for Khao Phansa: candles and "rain robes." 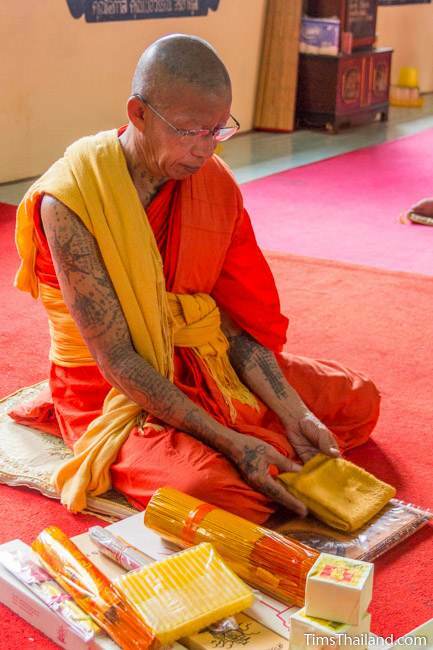 As mentioned above, monks no longer use the candles in their quarters, but they will be burnt in front of shrines and statues at the temple, the same as they are the rest of the year. 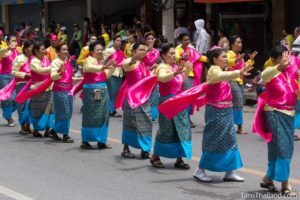 Like the candles, the thin sarong-like rain robes (pa ap nam-fon) once necessary when bathing was done outdoors, are also given out of tradition. 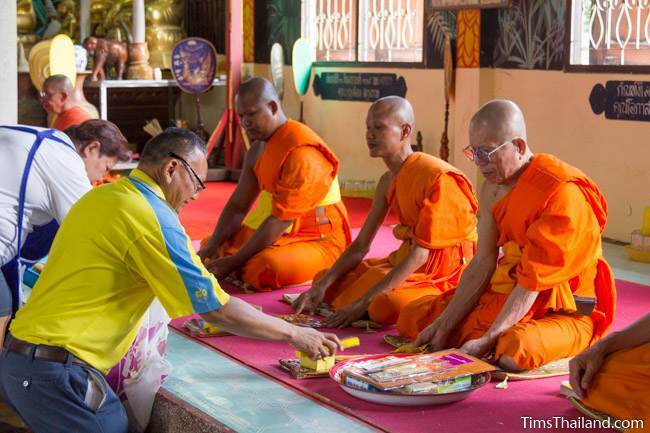 After the monks have accepted their donations and given the congregation their blessings, they all meet in their temple's ubosot for a mandatory, though usually informal meeting with the abbot. 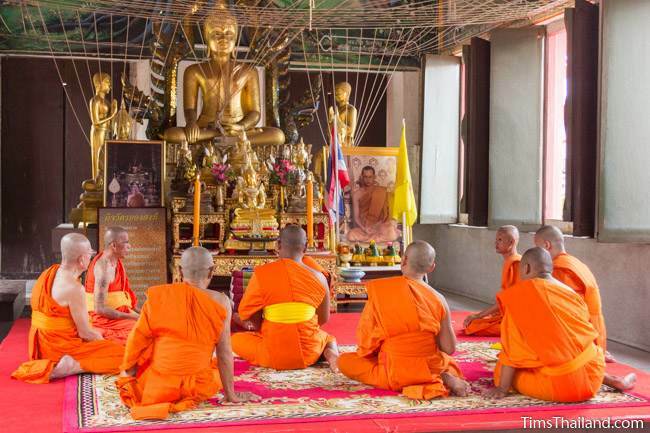 He reminds them of their obligation to remain at this temple for the next three months. 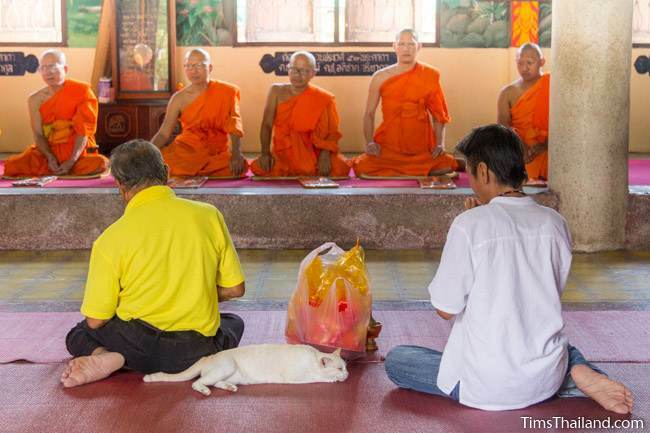 Basically it's the monks' check-in for the phansa Rains Retreat.